Divide the group into equal teams. Give each team a Nerf ball. On "GO", each member of the team passes the ball from armpit to armpit without the assistance of hands. If the ball is dropped or touched by a team member’s hand, the team starts over again. The first team to pass the ball successfully to each member and then back is the winner. 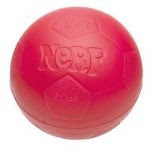 Can also be played with actual grapefruit or water balloons!